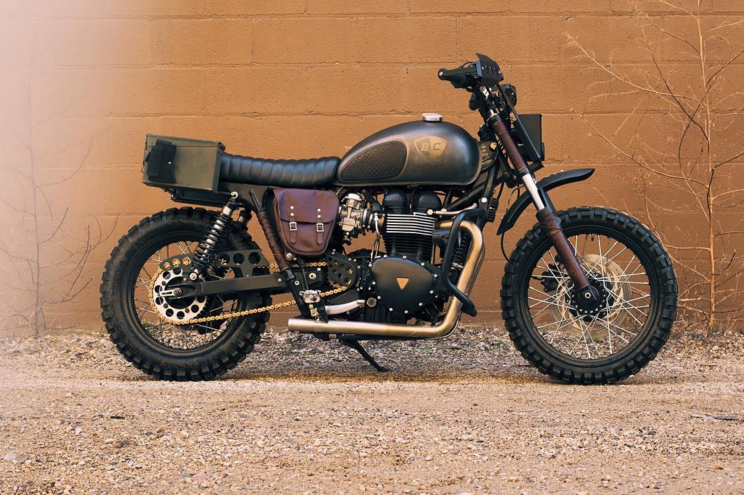 Cafe Racers of Instagram announced on their Instagram channel the winner of the dream custom motorcycle “Furiosa,” a Mad Max-themed 2015 Triumph Bonneville built by CROIG using British Customs Weekend Projects upgrades. The winner is Harvey W. Small of Oxnard, CA. The motorcycle was built to raise awareness and donations for charity Riders for Health, and to showcase the depth of motorcycle customization possible using factory-spec bolt-on parts. Furiosa, named after the leading character from Mad Max: Fury Road, was conceived by the community, with the intention to be given back to the community in an effort to raise awareness for Riders for Health, a not-for-profit charity providing healthcare to 21.5 million people across Africa by using reliable, well-managed transport. British Customs brought together community influencers, leading brands, up-and-comers, and others to shed light on this important cause. Cafe Racers of Instagram — also known as CROIG — opened up their social media channels to allow hundreds of thousands of followers to discuss and decide on a style of custom motorcycle they wanted to see built using only a series of factory-spec bolt-on Weekend Projects parts from British Customs. Weekend Projects take the guesswork out of personalizing your bike and upgrading the appearance, performance, ergonomics, controls, and more. The campaign was kicked off with custom motorcycle and industrial designer Jeremy Lacy who created multiple drafts of concept sketches which community members voted on inspired by the styles of British Customs upgrades packages. After progressing through multiple drafts of concept art, a final vision of the bike was created, and CROIG actualized it using the simple approach by using a series of British Customs Weekend Projects. The bike was built section by section with packages of factory-spec bolt-on parts from British Customs. To spur creativity and innovation, these parts packages are designed to allow the average rider with only minimal technical knowledge and basic tools to fully personalize a single model of motorcycle into a number of authentic retro styles, or to be mixed and matched to create an entirely personalized build. These packages eliminate the technical guesswork of what parts are necessary in order to customize a certain section of a motorcycle, and contain everything required to allow a rider to transform their motorcycle in a weekend. Weekend Projects cover all sections of a motorcycle, including appearance, controls, driveline, handling, lighting, and performance. Some of the authentic vintage styles a rider can achieve with Weekend Projects upgrades include tracker, scrambler, desert sled, cafe racer, bobber, hot rod, and resto-mod. British Customs expressed that they feel fortunate to have brought together a team of community leaders, brands, innovators, and icons to help make this custom build happen. Icons like motorcycle racing legend Eddie Mulder and Chippa Wilson, professional surfer and new heritage lifestyle personality, shared their own experiences with Weekend Projects and how their personal custom motorcycles were created using them. Brands GoPro, Simpson Race Products, Nixon, Thursday Boot Co., Stance, Abel Brown, Aether Apparel, Stance, and Hagon Shocks donated a range of products as part of weekly giveaways to the community while the custom motorcycle was being built. The complete build notes for Furiosa have been published on the British Customs blog, detailing every BC upgrade CROIG used to create this dream motorcycle. An in-depth series on the installation process using Weekend Projects is forthcoming on the British Customs blog, with teasers available on the British Customs YouTube channel.